Negative lever forces are not present in the GM of atoms vector forces replace them. 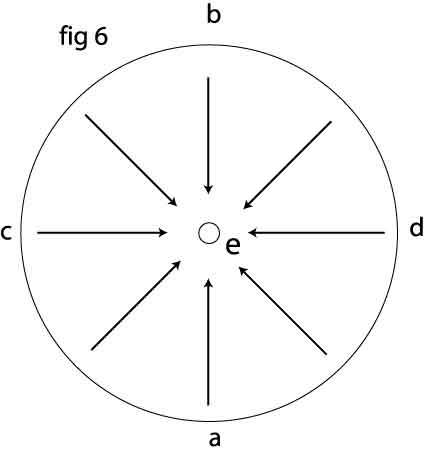 The bound state electrons are involved in an acceleration process as they travel from a to c to b in the elliptic orbit. 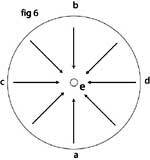 They then move closer to the nucleus and in a decelerating process, they move out again from b to d to a (Fig. 4). In the GM of atoms there should be a special two-fold GM vibration, no matter how many electrons are in orbit in an atom. When I talk about GM vibration orbits, from 7000 HZ to 40,000 HZ, that data is from comparing electron mass (weight), against machine orbiting weight 0.2 kg. This is a by 2.5 rev. per second resulting in to 0.125 kgf. However it can be calculated, with my limited means, the results represent a base for thought. It is logical to assume that heavier atoms, with a greater number of electrons, establish their specific earth surface weight, by all the electrons being involved in that process. Each electron will produce bundles, of GM orbits up to 40000 HZ. These bundles are a number of bound state electron orbits per second, into one direction orientated, to satisfy, planets known gravitational values, by this concept. 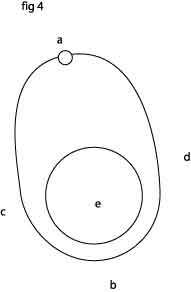 One would presume that not every electron orbit, is a GM shaped orbit! One and the same electron can easily do all the GM work per atom, according to (Niels Bohr Z 1) available atom vibrations, of 6.6 x1015 HZ. More than enough for any multiple Z atom, that is not only for GM centre earth directed but for planetary attraction and mass attraction three dimensional, by these estimations. Please note that by my GTM (gravitational time mechanics), calculations, the from7000 HZ to 40000 HZ frequency range, comes out different! These results are not concluded using any data of the machine. It constitutes a GM, indifferent technically, bound state electron orbit pattern, to the one, for the initial presumption. So, to search for the Key to the Universe, there is a wide interesting option, considering its other ingredients. To understand three-dimensional GM attraction, if we looked at an atom as a ball, the lettered points as GM bundles Fig.5, operating elliptical outward like FIG. 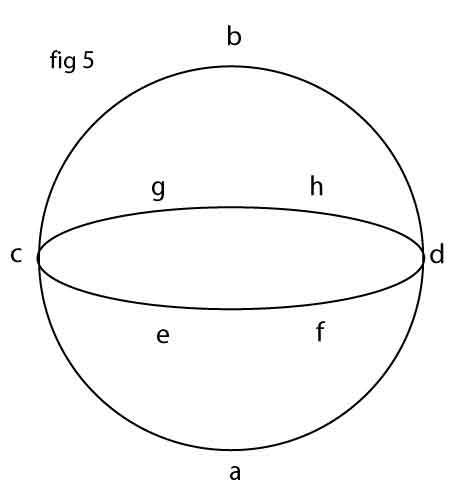 4 we take position a, for centre earth gravity; position b, for planetary attraction; position c, d, e, f, g, h for six point radial horizontal mass attraction noting that c, d, e, f, g , h do not have to have the same power, for loose adhesion (Cavendish experiment), as a and b, noting of course that a, always has to surpass b but in GM power. Considering compound adhesion, lets take 8 times 40,000 HZ equals 320,000 HZ nothing compared, to the available total of a hydrogen atoms vibration of 6.6 x 1015 HZ. Therefor 8 bundles of an average of 40000 HZ GM vibrations, strictly theoretically speaking, to create some, for GM reasoning visual technical understanding, could serve the total GM duty of a hydrogen atom. Every heavier atom would need 8 x 40,000 HZ GM bundles, times the number of extra electrons in that atom, having to move or gravitational stabilise an proportional extra amount of nuclei and further considering compound adhesion, to come to a somewhat realistic approximation. In loose horizontal attraction even so, Cavendish shows us the attraction is insignificant. Take compound adhesion, break a piece of wood apart and you know its different. Such adhesion must be by (GM) that of the second minus dimension, (U-2). Try to pull a strain of fine wire apart, if you want to explain this by GM gravitational adhesion this GM concept starts to wobble. On the other hand then, try to explain this in conventional terms! Like, solid masses might have a tied interwoven atom structure! In GM, extra compound GM bundles, my be in effect or an elongation of the elliptic electron orbits in an inner interacting but not in a opposing way therefor not effecting any outer gravitational duties. Also the internal adhesion is enormous, by the GM of (U-2), if you calculate it by the gravitational time mechanics (GTM) it seems to be their job, to keep it together. Just for curiosity I like to see an experiment by a special machine, a fine wire torn and measured infinitive accurately at braking point in the horizontal then in the vertical and compare the values.